When the name on a CD is that of one person, you know they are putting everything they can out there. You can hide behind a band name. You can't hide behind your own. Good or bad, that's your name up there, taking the credit or the heat. 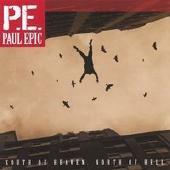 So it takes guts and talent to put your name on a CD cover and that's exactly what Paul Epic's got, as shown on "South of Heaven, North of Hell." His music is what you'd label pop rock / modern rock with a harder edge, if you had to. Labels aside, it's certainly good enough to hold your interest. The vocals, however, are another story. At first, I found them to feel forced and a bit flat. After a few spins, however, they grew on me and I discovered that I really like the way Paul sings. This very talented musician puts his heart on his sleeve when he performs and that dedication shines through. Paul is a very talented musician who rocks each and every tune like it was his last. The performance is outstanding throughout. Rock on, Paul! I look forward to hearing more from you in the future. Musician, pilot and world powerlifting champion, Paul Epic has led a very full life. Read more about him at http://www.paulepic.com.